UNITED NATIONS, November 5 -- With UN Secretary General Ban Ki-moon under fire for not raising human rights or the new Nobel Peace Prize winner when he met with Chinese President Hu, for external consumption Ban on Friday morning read out a defensive statement in a press conference on climate change financing. Inside the Ban administration, sources tell Inner City Press, the finger pointing has begun. Ban's senior adviser Kim Won-soo, the sources say, lays the blame for the coverage on his putative superior Vijay Nambiar and Department of Political Affairs chief Lynn Pascoe. They in turn pass the blame further downstream to Ban's spokesman Martin Nesirky, pointing at days of Nesirky saying Ban did not raise human rights to President Hu, then emailing out a late night statement that rights had been raised to other Chinese officials, whom Nesirky has left unnamed. A range of UN officials and staff interviewed in recent days have expressed concern that the brand of the UN has been hurt by the flap, culminating they said in the New York Times editorial questioning whether Ban should get a second term as Secretary General. While it appears that the staged Q&A at Friday's press conference is intended as Ban's response to the media, some say there's a need for Ban to address UN staff members and explain what has happened, and why. And if his climate change press conference was “not the proper occasion,” as he put it, to address human rights, he should set up a separate press availability to answer questions, and not from notes. Watch this site. Inner City Press: On climate change, there are various people saying that, in light of the elections that took place on Tuesday, and Obama, President Obama’s comments yesterday afternoon at a press conference that this makes the passage of climate change legislation less likely in the United States, that this will impact not only the Cancun process, but even this report that the Secretary-General is getting tomorrow. Some that have seen the report say that it assumes a median price of carbon of $25 a tonne by 2020, and if there is no US legislation that will not be accurate. So, I am just wondering what, it’s not so much a comment directly on the elections of what, what does this, what is the Secretariat, and it… the global goods team of the UN, does the results bode well for this report tomorrow and for the process that he is involved in? And, if not, what’s the plan to stay on track with the report that he is getting tomorrow? Spokesperson Nesirky: Well, two things. First of all, the key word there is process. It is a process that involves all the countries in the world in the United Nations Framework Convention on Climate Change. That is an enormous undertaking, as you know. And it involves all countries. The second point is that the report is being launched tomorrow. And I think it would be better to wait until then. You will have an opportunity to see the report tomorrow. Inner City Press: Well, I guess we’ll find out tomorrow. Spokesperson: You’ll find out. And there are other ways to address it, even if it isn’t at the press conference, because of the shortage of time or whatever, but there are always [ways] to address these things. UNITED NATIONS, November 4 -- For four days, Inner City Press has asked the UN about Under Secretary General Sha Zukang having given a “World Harmony Foundation” award to retired Chinese general Chi Haotian in Shanghai on in late October, just before Mr. Sha stood with UN Secretary General Ban Ki-moon at the closing of the Shanghai Expo. Ban's spokesman Martin Nesirky told Inner City Press that Sha was “not on leave” and that the online photograph of the award was the first the UN knew of Sha's involvement. On November 1, 2 and 3 Nesirky has repeated that some UN statement might be coming -- without saying anything more. On November 4, Inner City Press was able to ask Sha Zukang directly about the award and the controversy. 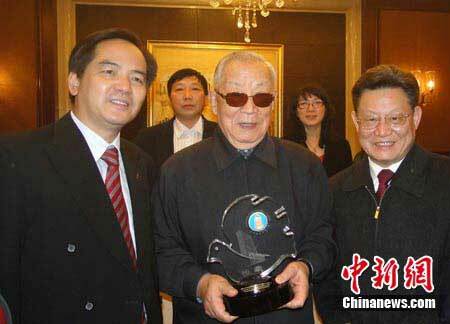 Sha told Inner City Press that “the general came to know I was in Shanghai” and he invited Sha to dinner. Inner City Press has previously covered the World Harmony Foundation trying to parlay its $110,000 contribution to the 2009 UN Day concert into photos with Ban Ki-moon. After Inner City Press ran several exposes, the photo session was canceled. But still Under Secretary General Ibrahim Gambari appeared for photos with the group, made up of businessmen and led by Frank Liu, in the Millennium Hotel across First Avenue from UN Headquarters. 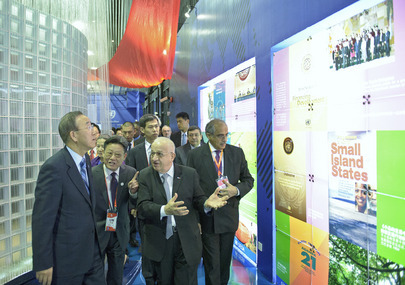 Here, the result was a photo of Under Secretary General Sha, general Chi Haotian and WHF's Frank Liu. Given the controversy, one would assume that Ban Ki-moon's office has asked Sha for an explanation, which is the above. What will happen next? Watch this site. UNITED NATIONS, November 4 -- “The horizon is broad,” UN Department of Political Affairs chief Lynn Pascoe told Inner City Press as he left the Security Council on Thursday morning. Inside behind closed doors, his briefing to the Security Council's 15 members was supposed to have not been limited to countries on the Council's agenda. The UK, whose innovation this was, declined through its Permanent Representative to list which countries had been discussed. Others present told Inner City Press that Yemen was mentioned, in the context of the Group of Friends which during the UN General Debate held a meeting, albeit across the street from the UN. Whether the recent posting of bombs made it more likely Yemen will be post on the Council's agenda is not known. Yemen still leads the Group of 77 and China, so any loss of control or sovereignty is unlikely. Another delegation told Inner City Press that Western Sahara was discussed in a less formal way that usual. Did France speak? No, the delegate recounted, [Ambassador] Araud just smiled. Pascoe emerged with Assistant Secretaries General Zerihoun and Tarasco, who rushed in late. So, Africa and the Middle East. Where were D-2s like Tamrat Samuel on Asia and Horst Heittmann on the Middle East? The scuttlebutt on the latter is that his transfer from Security Council Affairs was meant to keep the Middle East seat under “non-Arab” control, while another DPA staffer aims for the post Heittmann vacated. Pascoe, according to a source, urged the Council to go forward with a session on November 5 about Lebanon, specifically the Hariri Tribunal. On November 1, Inner City Press was told that the Tribunal would be discussed on Friday as Any Other Business. But on Thursday Ambassador after Ambassador told the Press to “ask Sir Lyall Grant” of the UK. Lebanon's Ambassador said he did not want to steal Lyall Grant's thunder, and would only speak about scheduling or the program of work when Lebanon regains the Presidency in September. 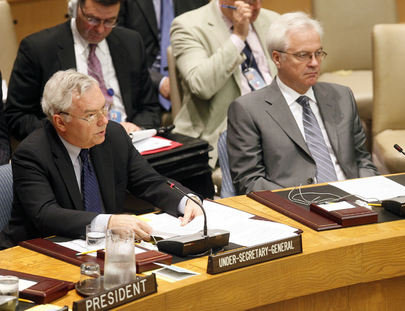 The UN Security Council is so full of secrets, one wonder how it functions. Does it? Watch this site.